For the first time, I got to see live and in person a championship banner rise to the rafters. 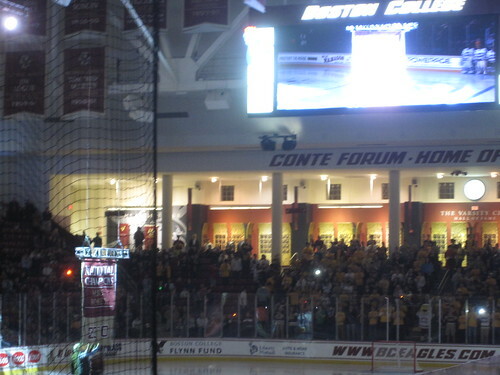 Friday night, BC celebrated its 2009-2010 NCAA hockey championship with a banner-raising ceremony that involved members of the 2010, 2008, 2001 and 1949 (yes, 1949) championship-winning teams. Also in attendance was the scrappy team from Merrimack, which nearly ruined the party. Merrimack was physical, borderline dirty, and early in the game got into the heads of BC's players, who looked uncharacteristically slow and sluggish throughout the game. Merrimack's goaltender was nothing short of heroic, stopping 39 pucks and fending off penalty kill after penalty kill. It was almost sad, then, when the goalie's error led to BC's winning goal. The Eagles sealed Merrimack's fate with a power-play goal by Pat Mullane about five minutes into the third period and skated away with a hard-fought, come-from-behind 3-2 victory. The Eagles were 2 for 11 (eleven!) on the power play, got outplayed all night and still managed to come away with a victory. Great teams are the ones that win even when they don't play well, and BC was one of those teams tonight. I probably won't be back to a BC game until January, but I do plan to get to Conte Forum fairly often this winter. BC hockey is still the best sports deal in town. As always, my unfiltered, unedited photo set from Friday night's game is online. Go Eagles!